Hot-smoked salmon, found in the prepacked deli chiller cabinet, has a wonderfully aromatic flavour. This dish is also good served cold as a salad. Cook the pasta according to pack instructions. Meanwhile, remove the skin from the salmon and discard. Flake the salmon into bite-sized pieces. Drain the pasta thoroughly. Return the empty pan to the heat and add the oil, spinach and rosemary. Stir-fry for 1 minute, until the spinach is just beginning to wilt. 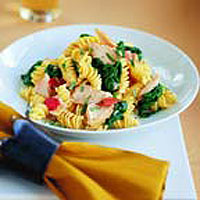 Return the pasta to the pan and stir, then add the salmon, tomato and crème fraîche. Stir to combine and season. Cook for a further minute to heat through. Serve hot, with lemon wedges to squeeze over. Try adding some crushed chillies for an extra kick.